Murcia does not boast a large City centre but what it lacks in size it more than makes up for in appearance. It is cleaner than many Spanish Cities. It has some striking buildings, all located within walking distance of each other. It also has some of the smartest City centre shops. Murcia is a vibrant city with countless tapas bars and shops. One of the must-visit places in the town is no doubt the impressive Cathedral Santa Maria on Plaza del Cardenal Belluga, but other places like the Salzillo museum and the Real Casino are also very worth visiting. English version of Tourist Video, Cartagena, Murcia. Tourist information video of Cartagena, Murcia in English. 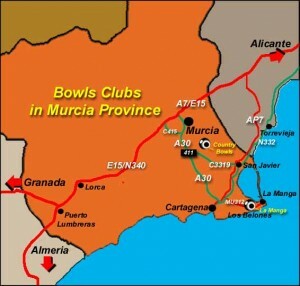 Murcia Bowls province lies between Alicante to the north east, Albacete to the north and Almeria to the south. 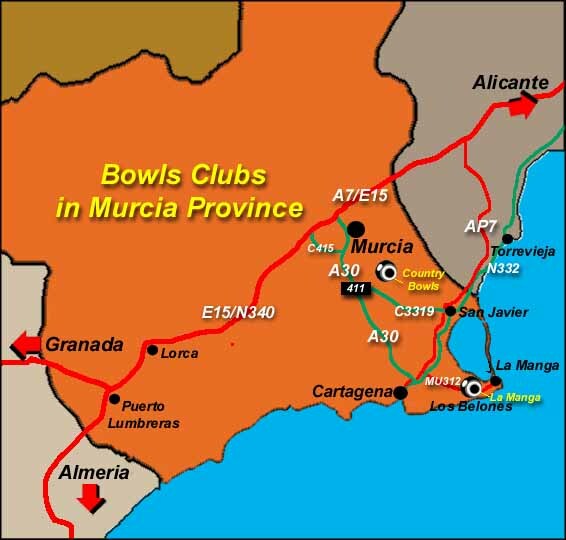 Up to recently bowlers have simply passed through this area when travelling between the three principle bowling zones in Spain – Malaga, Almeria & Alicante. This situation appears to be changing, as the province now sports two clubs of its own – Country Bowls & La Manga. Murcia province lies between Alicante to the north east, Albacete to the north and Almeria to the south. The New Upcoming Paramount Park in Murcia. The Project covers an area of development of 1,580,000 square meters, where the construction of a PARAMOUNT THEMED PARK will be developped on a surface area of 550,000 square meters and a hotel, commercial, business and food and beverage area – LIFESTYLE CENTER — on a surface area of 1,030,000 square meters. After deep studies, the privileged Region of Murcia and in particular the spectacular area of Alhama has been chosen to develop a Paramount Park in Spain. An emblematic area focused on the history and images of the well-known movie studio Paramount and its large and famous movie production. Its excellent location and Mediterranean climate will make this themed park, unique in Europe, the destination chosen by millions of tourists to enjoy its amazing rides that will let them live the stories and movie spectacle in a new dimension. Next and related to the Paramount Park, completing and making the most of its tourist impact, a big hotel, comercial and night leisure complex will be developped, as well as a cultural and business core in which visitors of the Park and the Region of Murcia will be able to know a real tourist destination with an international level. The complex named LifeStyle Center is that part of the Project where all type of business, commercial, cultural and leisure activities in general will be carried out throughout the year and during all day long. Is, with no doubt, the best complement so as Alhama de Murcia and its Paramount Park will become one of the most important tourist destination of Spain as well as one of the most advanced comprehensive leisure center of Europe. Los Alcazares, with its beautiful blue flag beaches, is situated in the Murcia region of south-eastern Spain; known as the Costa Calida (Warm Coast). Los Alcazares is the only municipality to receive Q Awards for Quality for all of its beaches. The area has an average of 320 days of sunshine each year. The town sits on the western shore of the Mar Menor, a small sea partially separated from the Mediterranean Sea by a strip of land called La Manga. It is a very relaxed Spanish resort that really welcomes international visitors. The Mar Menor is warm and calm, ideal for children and adults alike. Sailing, kite surfing, windsurfing, scuba diving are all very popular.